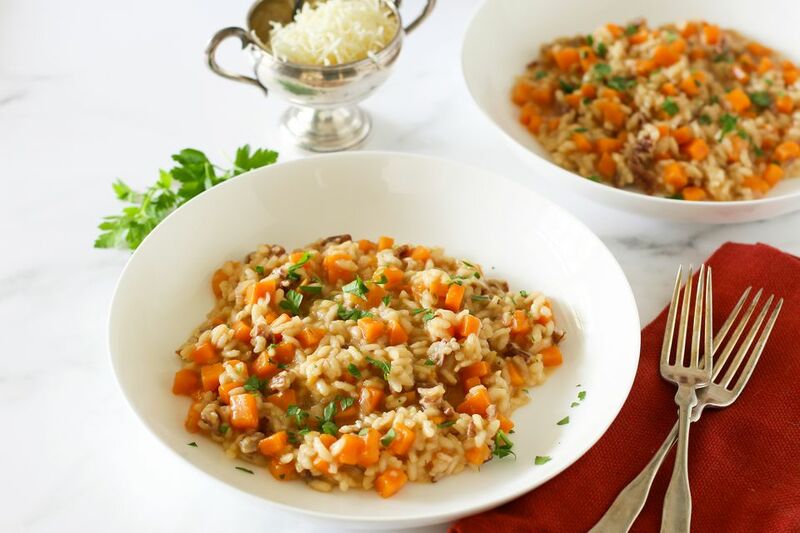 This risotto is a fabulous savory combination of sweet potatoes, pecans, and Parmesan cheese, and you'll make this dish again and again. Serve the risotto as a side dish or serve as a main dish or lunch with a chopped salad and crusty bread. Arborio rice is an excellent choice for risotto. Carnaroli is even better, but it is harder to find. Avoid long-grain rice; it doesn't have enough starch to make a creamy risotto. Sushi rice might work in a pinch, but it won't give you the same results. Heat 4 cups of vegetable broth to the boiling point; reduce heat to the lowest setting to keep it hot. Meanwhile, while the broth is heating, prepare the vegetables. Peel and mince the shallots. Peel the sweet potato and cut it into 1/4-inch dice. Chop the pecans. In a medium saucepan melt the butter; add the minced shallot and pecans; cook until shallot is tender. Add the rice to the shallot and pecan mixture and cook, stirring, for 1 to 2 minutes. Stir in sweet potato. Stir about 3/4 cup of the hot broth into the rice mixture. Cook over medium-low heat, stirring constantly, until the liquid has been absorbed. Stir about 3/4 cup of the hot broth into the rice mixture. Cook over medium-low heat, stirring constantly, until the liquid has been absorbed. Continue adding liquid, about 1/4 cup to 1/3 cup at a time, stirring frequently, until the rice and sweet potato are tender, but not overly soft. The texture should be creamy and a little loose. This will take about 25 minutes and about 3 to 4 cups of broth. Remove the saucepan from the heat and add the Parmesan cheese. Taste and add salt and freshly ground black pepper to taste. Serve with extra Parmesan cheese and garnish with green onion or parsley, if desired. Good quality ingredients will give you the best results, and risotto is no exception. Use a good quality vegetable broth in risotto, preferably low sodium or unsalted. If you have homemade broth, all the better. And use fresh Parmesan cheese. If you don't grate it yourself, you'll find grated fresh Parmesan in the deli section of your supermarket. It has the most wonderful nutty flavor—nothing like the boxed brand. Never rinse the rice for risotto; the creaminess of the dish largely depends on the the grain's starch. When the rice is done, it should not be mushy. It will still have a little "bite." Instead of green onions, add a few tablespoons of chives to the finished risotto. For more sharp cheese flavor, use Pecorino Romano instead of Parmesan. This cheese is made with sheep's milk and it has tangier flavor. Replace the Parmesan with about 1/2 cup to 3/4 cup of Fontina or Gruyere cheese. If you like wine in your risotto, replace about 1/4 cup of the first addition of vegetable broth with a good quality dry white wine. Feel free to omit the pecans or toast them and add them as a garnish. If you don't have vegetable broth, use unsalted or low sodium chicken stock.